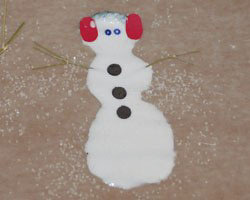 This snowman glue craft is an easy project for kids or adults alike. 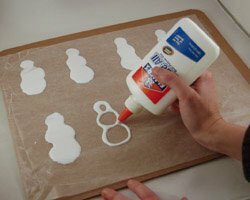 These snowmen are made out of regular white school glue. The glue is squeezed out on to wax paper, and decorated with beads, bits of paper, and small pieces of fabric. 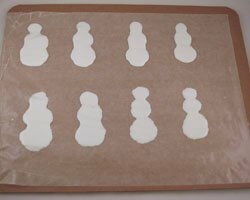 After the snowmen are allowed to dry for about two days, they peel easily off from the wax paper. 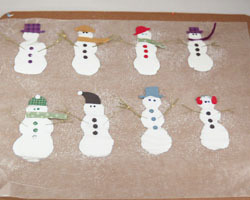 They can be attached to a ribbon, as shown below, to become a cute snowman garland. 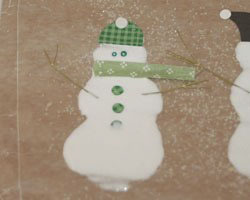 Or, individual snowmen can be turned into magnets, pins, or used to adorn gift packages and bags. These come out really cute and are fun to make! 1. 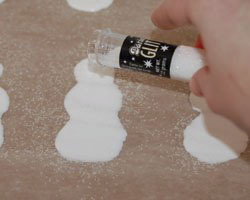 Begin the snowman glue craft by choosing your work area. If you use a table, be sure you can leave the snowmen there undisturbed, for a couple days to dry. A better solution is to find a piece of cardboard to work on so you can move it to a safe location to dry. 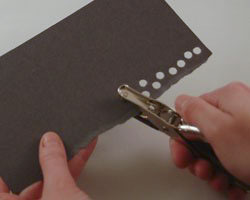 Tape a piece of wax paper down on your work surface or the cardboard. 3. Optional: Sprinkle each snomwan with some clear or white glitter to give them some extra sparkle. 4. 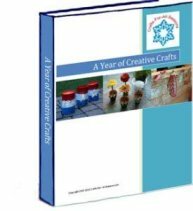 Now it is time to be creative! Use little bits of scrap paper and bits of fabric to make buttons, eyes, and other features. I used small seed beads for eyes, paper punched holes for buttons, and cut out different shaped hats. For the arms, I used the delicate branches of some dried baby breath I saved from a flower arrangement. You could also find small twigs for the yard, or try some pipecleaners or thin wire. For the earmuffs, I cut out small ovals from construction paper and connected them with a small piece of yarn. Don't worry if the features "sink" into the glue. As the glue dries it will become more opaque so you will be able to see the features. 5. Allow the snowmen to dry for about two days. 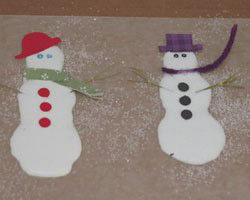 Then, gently peel each snowman off from the wax paper (a flat spatula will come in handy). 6. 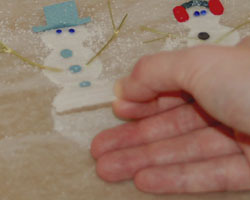 After the snowmen are dry, you can glue the backs of them to a ribbon to hang as a garland. You can also use these as magnets, on greeting cards and gift tags, or make them into a pin.